Ensemble dramas are among my favorite movies, in part because i’s thrilling to watch well-matched, gifted actors play off each other, instead of just one star dominating every other shot. Live theatre can be more satisfying than what’s at the local multiplex for a similar reason: you’re looking at tested pros taking a script and running with it, all the while igniting potent interpersonal chemistry. Filmmakers like indie stalwart Oren Moverman still recognize this, making riveting adult-themed pictures that resonate. 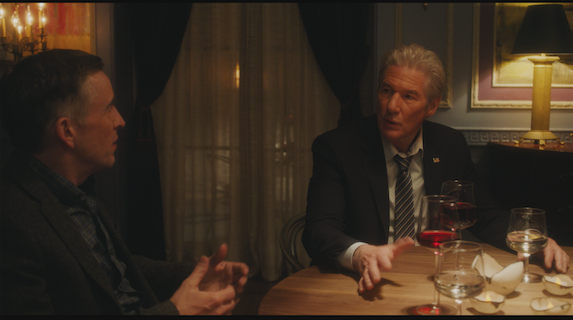 The writer-director’s latest work is The Dinner, his adaptation of Dutch author Herman Koch’s eponymous satirical novel, which was an international bestseller. The story unfolds from just before, through to the aftermath of, a dinner at an upscale restaurant (shot on location at impressive Alder Manor, a historic Renaissance Revival mansion in Yonkers), where two couples meet to discuss an urgent matter concerning their miscreant teenage sons. But it will take almost a full set of courses, from aperitif onward, for the parents to get down to the nitty-gritty. By the time we arrive at the digestif, it’s a wonder that they’ve kept their food down. The Dinner is Moverman’s fourth time as director. He also wrote the screenplays for his films, starting with The Messenger (2009), which he co-wrote with Alessandro Camon (the film garnered them an Oscar nomination for Best Original Screenplay, and for Woody Harrelson a Best Supporting Actor nom); then Rampart (2011), co-written with James Ellroy, and Time Out of Mind (2014), which he scripted from a story he co-wrote with Jeffrey Caine. Moverman’s films deal with weighty social issues—war, alcoholism, police corruption, homelessness, mental illness—but not in a preachy way. In The Dinner, he uses America’s Civil War both as the background for Paul’s breakdown (who collapsed under the pressure of writing a book on the subject), and also as a metaphor for the deep, still smoldering divide between Stan and Paul, which is about to turn volcanic. If there’s a common link between these four films, it might be the lengths people will go to when their backs are against the wall. What were the steps you took to adapt Herman Koch’s novel, first as a screenplay for Cate Blanchett’s directorial debut, and then, after she left the project due to scheduling conflicts and you took the helm, to shape it into what you wanted as the director of the film? The first draft of an adaptation tends to be about the book, and tends to explore what worked in the book that would work in a film. The first draft of The Dinner followed the novel’s action to a point, except that I moved it to America [not Amsterdam, the book’s setting]–because Cate wanted it to be an American story–then added Gettysburg, then an assistant, and also included a trip to Berlin. Cate wanted to focus primarily on the adults. Then when I took over, I expanded the mental health issues, added Stan’s introduction of a Congressional mental health bill, changed his assistant to a woman, and had both brothers go to Gettysburg. An eminent colleague saw your film at the same press screening as I did, and although he said the acting was great, he told me afterwards that he found the characters impossible to like, because they do such awful things. But, I replied, the film sets that awfulness up at the very top, when we hear Paul’s voiceover narration about how much he prefers the ancient Greeks, how by the time we got to the Renaissance it was clear humanity was on the wrong track, and how our current modern era is worthless. In other words, the audience is getting a heads-up to expect something along the lines of a classic Greek tragedy as the film unfolds. The novel doesn’t begin the same way; was that passage your invention? Paul looks at things in a very dramatic way, and responds to them dramatically. The gist of what he is saying there—that he likes the ancient Greeks, Romans, and Egyptians—comes later in the book, in a chapter at the school where he last taught, as he’s ranting against the principal. In the movie I decided to put that speech at the top, and added the comments about the Renaissance and the modern age. It’s Paul’s capsule view of what the modern age is, how we’re all hopelessly overwhelmed by technology, institutions, relationships, demands, and history. Embedded in that first voiceover are the themes of the movie, something we can realize by the end if we go back to think about it. As a provocation to start an extended conversation [between the two couples over dinner], it has so many strands. The book latched on to the many aspects of Paul’s narrative threads very well, but I chose to break them down differently, as you can see in the three different voiceovers Paul has in the movie, at the beginning, middle, and end. In the middle voiceover, when Paul is complaining about Stan, their mother’s favorite son who always gets what he wants, Paul says that everybody falls for Stan, but his women leave him before long. Because Stan’s not who he appears to be, he’s not who he says he is. Everyone thinks he’s so ethical and humane, but by the time we get to the end of the couples’ evening together, we’ve seen different sides of Stan. I’m glad you brought up this issue of the unreliable narrator, because that’s one of the key elements in your movie. In the book, eventually the reader learns that Paul, who’s the novel’s only narrator, is not to be trusted. In the film, sure, we get the idea very early on that Paul is a little off, that there’s something wrong here, but as the narrative progresses, and we learn more through a series of flashbacks, we begin to wonder about the other characters, and if they’re maybe playing him, manipulating him for reasons as yet unknown–like in the basketball sequence, where Paul’s son denies that he ever threw the ball through the smoke shop window. Are we meant to think he’s trying to gaslight his father, and absolve himself of blame? At the end of the day, the movie takes this idea of the unreliable narrator and applies it to everything. Who really can you trust? Yourself? Memory is faulty. Your friends and family? Everyone has his or her own agenda, and is self-serving. History? History is written by the victors. In the case of the basketball sequence, you have two unreliable narrators, father and son—or even three, if you count the store owner. It seems to me that at the time the broken glass incident took place, in that flashback the kid is too young to have thrown the ball with the required amount of force. He couldn’t have done it. The father put the blame on his son so that he, Paul, could look heroic by coming to his son’s defense, while at the same time appearing blameless. I’m not going to ask anything about Richard Gere, but will just comment that after seeing him in your previous film, Time Out of Mind, and in Joseph Cedar’s new film that’s also out now, Norman: The Moderate Rise and Tragic Fall of a New York Fixer, on which you served as a producer, it strikes me that Gere has become your muse. But let’s talk about Steve Coogan, a remarkable actor with considerable range. I’ve seen a lot of his work, and I like Steve Coogan, although he scares me: he’s got that underlying British-Celtic-feral thing going on. He seems like a hard-charging guy—he’s made almost 50 quite diverse movies by now, so, clearly he’s driven. But I’ve never seen him do anything like this before. How did you get this amazing performance out of him? I think the answer is in how you stated the question. You’re kind to give me credit, but the performance is Steve’s. My job was to recognize that he had this performance in him. Steve is very smart and quick, and has great comedic instincts; he also has anger in him, because he cares deeply about a lot of issues involving injustice. He’s well-read; he’s cultured; he has a very rich core. And even though this is not a comedy, he brought all of that to bear in the role of Paul. Paul may suffer from mental illness, but what he has to say is not very far off the mark from what’s going on during the dinner conversation. It’s really quite close to fact. Well, he broke my heart, and your movie did, too. Getting back to my earlier reference to Greek tragedies, unlike those antique plays, at the end of The Dinner there’s no catharsis. The audience doesn’t leave feeling purged, in the sense of emotionally released. Partly that’s because the ending is ambiguous, which for me is not a problem, because that’s life. Yes, this is definitely a modern story. The ending is unclear, and that is where we are today. Many of us in our complicated world are lucky to be regarded as comfortable, but there’s a cost: just look at us. There is no catharsis.